Hate sequels? Well, tough, because Ice Cube loves them. He will ride the gravy train of any project for as long as he wants (Next Friday, Friday After Next, Barbershop 2, Ride Along 2, Are We There Yet, Are We Done Yet…seriously is he done yet? ), and this time I have to applaud his shameless re-hashing. 22 Jump Street is the most hilarious movie of the year. Jenko and Schmidt (Channing Tatum and Jonah Hill) are still riding high from the unlikely success of their undercover operation, only to find that they really aren’t well-suited for anything else. So they go back to a new and improved headquarters directly across the street from their old base. This time, they are headed to a college campus where a student has died after using a new trendy drug. Everyone keeps reminding them that all they have to do is exactly what they did last time, in a brilliantly clever reference to how cheesy and unnecessary most sequels are. But they do not do anything exactly the same way as before. This time Jenko’s cover “Brad” is super popular and is the star of the football team while Schmidt’s cover “Doug” is the odd man out, doing most of the police work and playing the part of a jealous girlfriend. They still have a few gross-out moments and show the effects of the new drug during Brad and Doug’s hysterical trip, but the writers and actors were smart enough to alter certain details and wink at the camera at all the right moments. They make fun of their other film projects and real-life quirks, like how Ice Cube is very far from the young rapper who was “Straight Outta Compton” and how Jonah Hill’s persona is very close to that of Seth Rogen’s. This is making me so much money! All of the original castmates, like Nick Offerman as Deputy Chief Hardy and Rob Riggle as Mr. Walters, are just as outrageously funny as before, but newcomer Amber Stevens (the fresh-faced Maya) effortlessly lightens some of the heavier moments and Jillian Bell (the amusingly sour-faced Mercedes) nearly steals the show from both the male leads with her acerbic cracks on how old they look. Wyatt Russell (Zook) also ups the bro factor by giving Brad a best friend who is also hot, dopey and endearing. 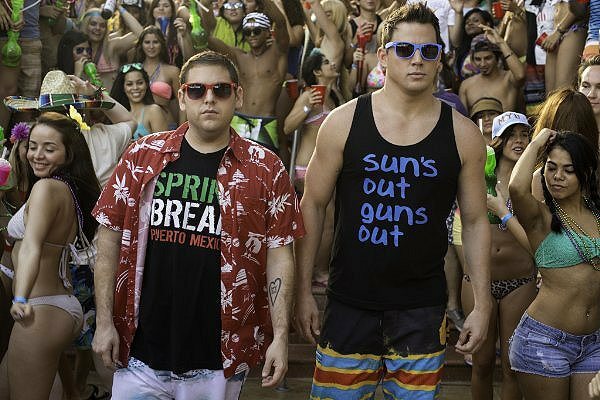 Typically, the best jokes are saved for the trailer and the rest of the film is just a series of awkward silences until the next funny thing happens, but 22 Jump Street is so packed with awesome jokes that rarely 30 seconds went by without someone in the theater laughing out loud. Go see it, and be prepared to go and see it again so you can catch the dialogue that was drowned out by your inevitable giggling fits.